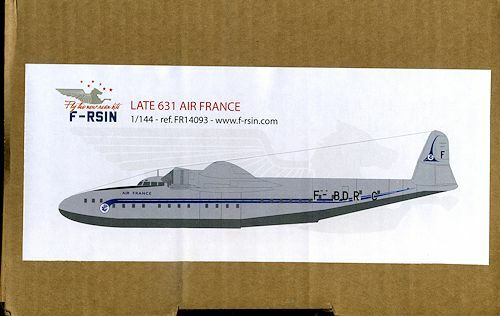 The Latécoère 631 was a civil transatlantic flying boat built by Latécoère, the largest ever built up to its time. The type was not a success, being unreliable and uneconomic to operate. Five of the eleven aircraft built were written off in accidents and one was lost lost during World War II. The Latécoère 631 was the result of a specification issued in 1936 by the Direction Générale de l'Aviation Civile for a 40-passenger airliner with a range of 4,000 kilometres (2,500 mi). The aircraft was ordered in 1938. It was intended that it would be powered by six Gnome et Rhône P.18 engines of 1,650 horsepower (1,230 kW) each. A competitor for this specification was the SNCASE SE.200 Amphitrite. Construction of the aircraft was stopped due to the outbreak of World War II and was not resumed until after the signing of the Franco-German Armistice. The prototype, registered F-BAHG, first flew on 11 November 1942. It was subsequently confiscated by the Germans, and passed to the Luftwaffe, who allocated the codes 61+11. The aircraft was flown to Lake Constance, where it was destroyed in an attack by two Royal Air Force de Havilland Mosquito aircraft on 17 April 1944. SNCASE SE.200 Amphitrite 20+01 was destroyed in the same attack. The second aircraft, F-BANT, first flew on 7 March 1945. It was powered by six Wright Cyclone engines of 1,600 horsepower (1,200 kW) each. Four aircraft were purchased by Air France, and entered service on the Biscarosse-Port-Étienne-Fort de France route in July 1947. The aircraft were withdrawn from service in August 1948 following the loss of F-BDRC. SEMAF operated two aircraft until 1950, when the survivor was withdrawn following the loss of F-BANU. The Société France Hydro operated one aircraft until it was lost on 10 September 1955. This was the last flying aircraft, with the remaining four survivors being scrapped. The Latécoère 631 was not a success due to it being unreliable and uneconomic to operate. This is the first actual resin kit I've seen from F-RSIN. I did their DC-7 short run kit a few years back and found it to be a bit of a challenge to build, but the end result was a very nice model. This one is quite nicely molded with a solid fuselage, solid one piece wings and tail planes with the fins molded in place. This should make alignment a lot easier. There are pegs on the flight surfaces that will fit into holes in the fuselage. I should mention that there is some flash on all the parts, and the smaller bits are embedded in resin wafers, but clean-up should be minimal at best. 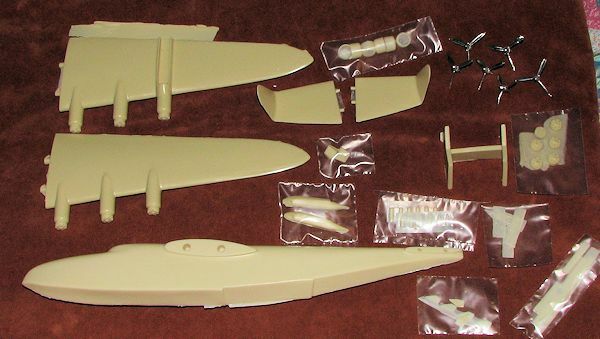 Each of the wings has engine cylinders molded in place and there are additional cylinders in with the rest of the parts, which I assume one will put into each of the resin cowlings and attach to the extant engines. Other bits in resin are the floats, float braces (which will be a challenge to remove from the resin wafers), carb and oil cooler intakes, float doors, flap hinges and some bits that I couldn't identify. A resin display stand is also included with the kit. There are cast metal props and spinners. The casting is fairly well done, but on each prop assembly, one blade appears to have suffered from major mold shift. All the props were slightly bent from banging around during shipping. Speaking of which, when I got this kit, the fuselage was firmly wrapped in foam wrap while the wings and tail pieces were loose in the box. All the resin bits were in their separate bags according to the piece and these were all in another bag. The metal props were also in their own bag. Nothing appears to have broken, though there was a lot of large flash detritus in the bottom of the box. Instructions are rather minimalist, consisting of a full page with two color three views (top, front and left side). Obviously one is for decal placement with the other the 'construction' page. It is not always clear what is what, but with some sleuthing you can figure out what goes where. There is no color information provided, though it appears the aircraft is a light grey with a black lower fuselage. The decals include cockpit and cabin windows as well as a black anti-glare panel. None of these features are engraved on the resin fuselage so no worries about not having it all line up. Decals are nicely printed and appear to be ALPS printed as there is no visible carrier film. My experience with F-RSIN decals is quite positive on the DC-7, though I found them to be very thin and prone to tearing, especially on the long bits. I recommend precoating them with your favorite clear prior to cutting them off the sheet. Overall this is a nicely done kit of a very obscure aircraft that you will probably not find kitted anywhere else. The molding is excellent and while some of the construction may prove to be a challenge (and I'm thinking the resin float struts here), the end result will be a pretty neat and most unusual presentation. It is a kit I cannot recommend to beginners because of the resin float struts (though I guess you could build them retracted as in flight), but if you have had a few resin kits in your repertoire, then you should find this one to be within your skills. For those wanting to know how big this will be, the fuselage length is just shy of a foot. Very much recommended for the obscure airliner or flying boat fan. Thanks to DMC/Cooper's Models for the preview kit. You can find this kit at this link.